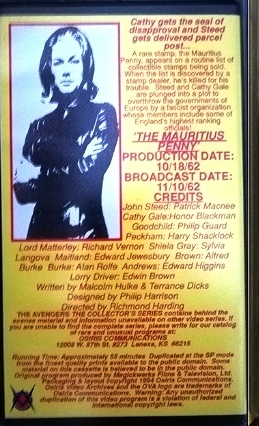 A rare videotape with the Avengers episode "The Mauritius Penny" (Cathy Gale) released in 1994 by the USA illegal company "Osiris Communications" (Lenexa, Kansas). It seems that in each state of the US there was at least one company that produced "pirated" videotapes with the series in old times. 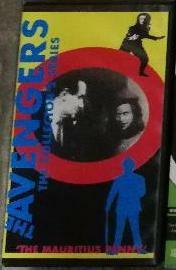 I'm always interested in VHS releases. I have a couple of A+E '63 tapes for the episodes 'Conspiracy Of Silence' and 'Six Hands Across A Table'. I think these A+E videos were released with 'enhanced sound'. It was quiet dialogue that was made louder I think. I hope to compare some episode with the same episode on another VHS tape, sometime!, to hear any difference. Yes, this will interestingly. I have only video file rips for Cathy Gale episodes (USA prints) and never saw other ones, although this is in online. Well, after comparing the clarity of the sound on 10 minutes of 'A Chorus Of Frogs' on the A+E '63 tape and the Monochrome Collection tape, there is no difference. But I enjoyed watching it!